These two photographs have been characterized as "the best" among those ever taken of an unidentified flying object (UFO). They were taken on May 11, 1950, by a Mr. Paul Trent from his farm near McMinnville, Oregon. His wife was the one other witness to the alleged sighting. The Trent/McMinnville photographs remain among the most publicized, discussed, and debated in UFO history. 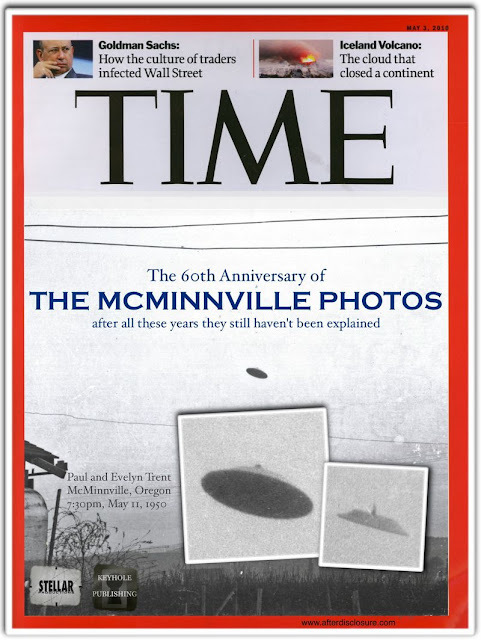 Fantasy Time magazine cover commemorating the 60th anniversary of the Trent photographs. "[O]ne of the few UFO reports in which all factors investigated, geometric, psychological, and physical, appear to be consistent with the assertion that an extraordinary flying object, silvery, metallic, disk-shaped, tens of meters in diameter, and evidently artificial, flew within sight of two witnesses." (Gillmor, 1968, pg. 407). "[D]o not rule out the possibility that the object was a small model suspended from the nearby wire by an unresolved thread." (Gillmor, 1968, pg. 402). Despite a growing disillusionment with the world of "uforia," I had never been quite able to shed my childhood fascination with the possibility of otherworldly visitations to our planet. In this, the Trent photos became for me the equivalent of a ufological "Shroud of Turin"--a tangible reason for clinging to the hope that at least a minute portion of UFO sightings might be of truly extraordinary (alien?) objects. The debate about the legitimacy of the photos has long centered on dueling, abstruse interpretations of this or that photogrammetric aspect of the UFO images that leave the non-expert bewildered and unable to decide. Yet, as sometimes happens in life, a fresh perspective suddenly emerges that lets one finally see what had not been previously apparent. For me this fresh perspective came in the form of a picture (below) that began to circulate on the web. 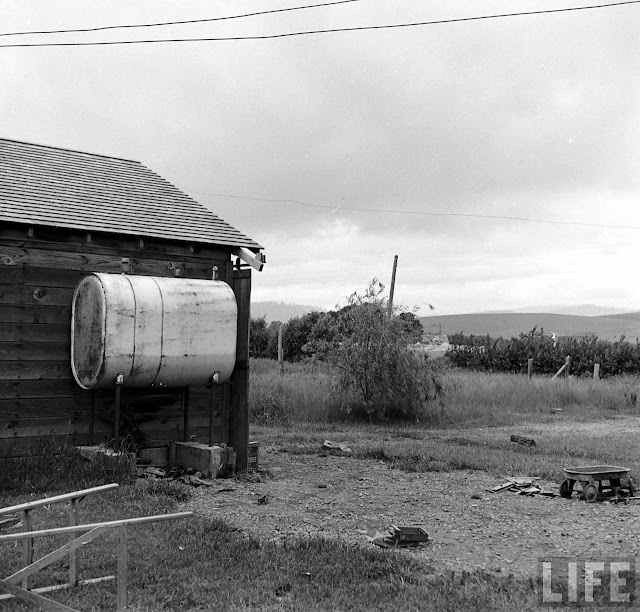 It was one of many unused photos taken by Life photographer Loomis Dean in connection with the story that the magazine ran about the incident on June 26, 1950. 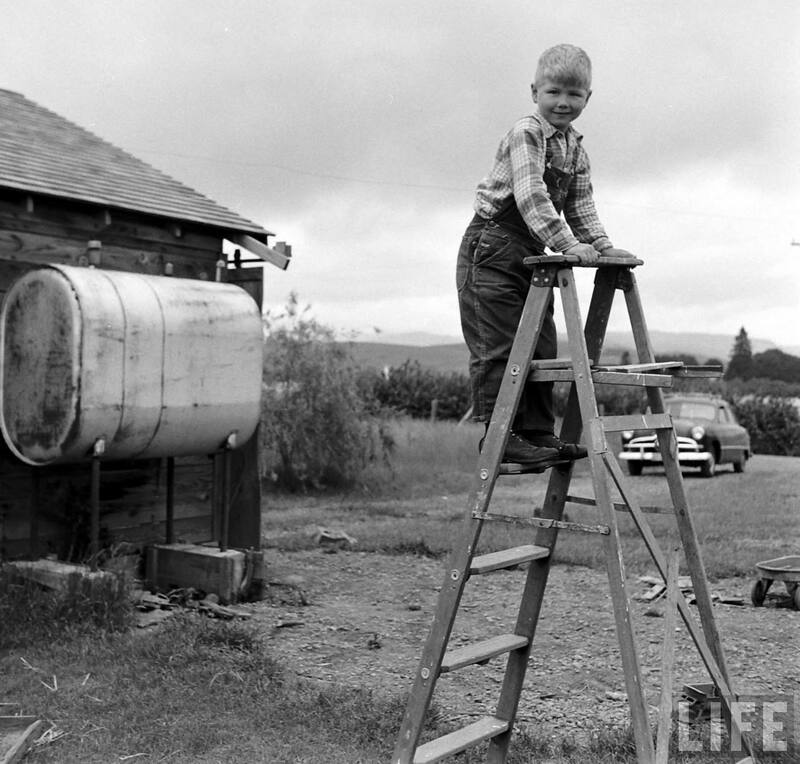 The boy on the ladder, ostensibly Paul Trent's son, is posed near the spot where a small object could have been suspended from overhead wires. 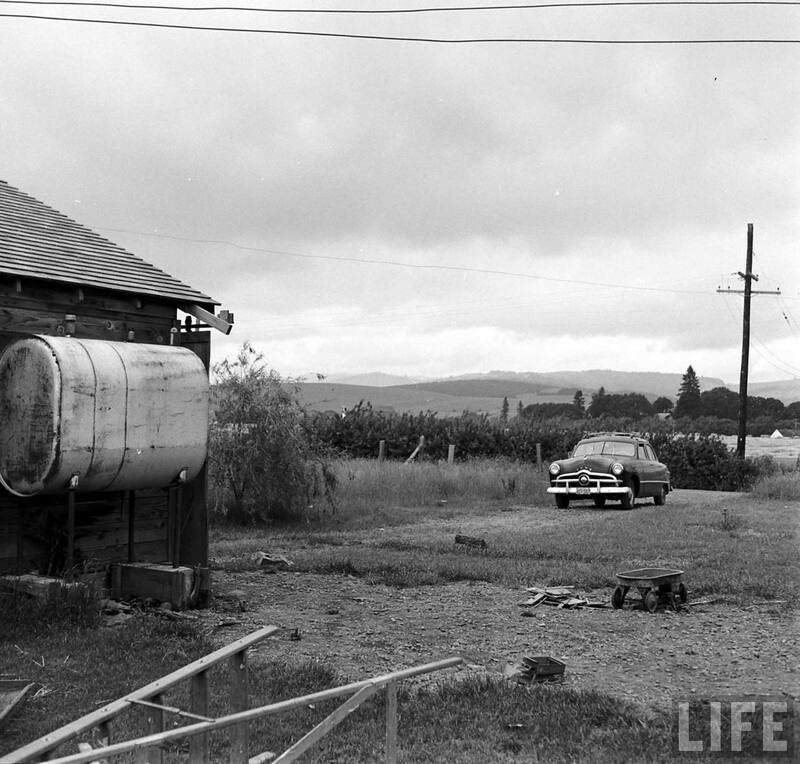 The wires, which ran between the house (off camera to the right) and the garage (left of frame), can be seen in the UFO photos and (along with the toppled ladder in the foreground) the other Life photographs shown below. These photos allow an appreciation of the open area at the front of the property, just beyond the overhead wires, which the camera angles of the Trent photos do not. Although uncommented and never published, the Life photos speak volumes. 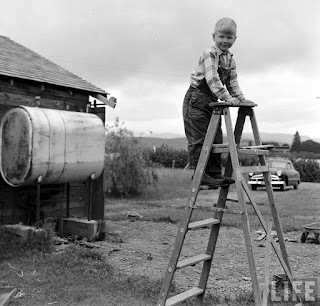 The "boy on the ladder" picture attests to an unspoken suspicion on the part of the Life photographer about a possible staging of the UFO pictures. 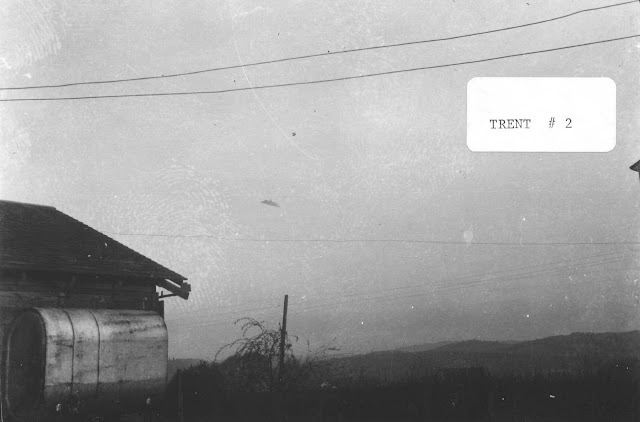 It strikes one that this photographer on the scene would perhaps have been made suspicious by the incongruousness of the locations from which Trent took his two UFO photos. 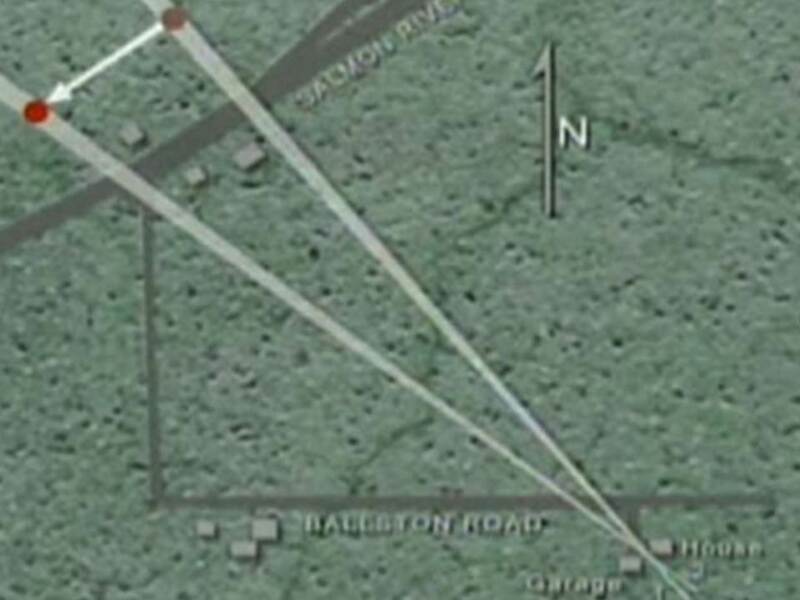 The locations of Trent's UFO photo #1 and photo #2 are indicated on the map below. The object reportedly moved in a westerly direction. From these two backyard locations, the view of an object in the sky relatively close to the horizon would have been restricted by the garage on the left (west) and the nearby house on the right. For the photographs to have been taken from the backyard rather than from the unobstructed open space in front of the property is utterly illogical. This is highlighted by the fact that, according to the testimony of the witnesses (Gillmor 1968, pg. 397), Mr. Trent, upon sighting the object (apparently from the backyard, in the company of Mrs. Trent), ran to the car to get the camera thinking it was there. Presumably the car must have been inside the garage or in the driveway (abutting Christensen Rd., misidentified as "Ballston Road" on the map) near the location of the car seen in the Life photos. Mrs. Trent, meanwhile, remembered that the camera was in the house, went there to get it and brought it to Mr. Trent. 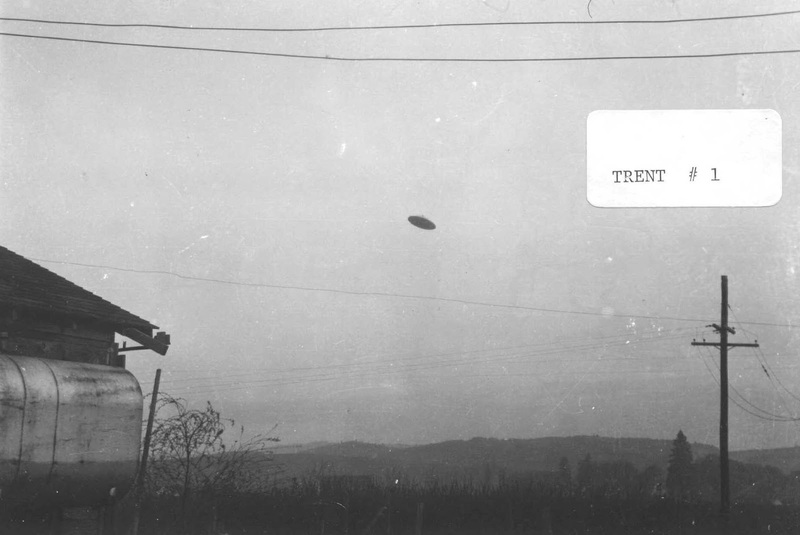 These actions further reinforce the question of why the Trents would choose to photograph and continue to observe the "flying saucer" from the backyard rather than the unobstructed front of the property. 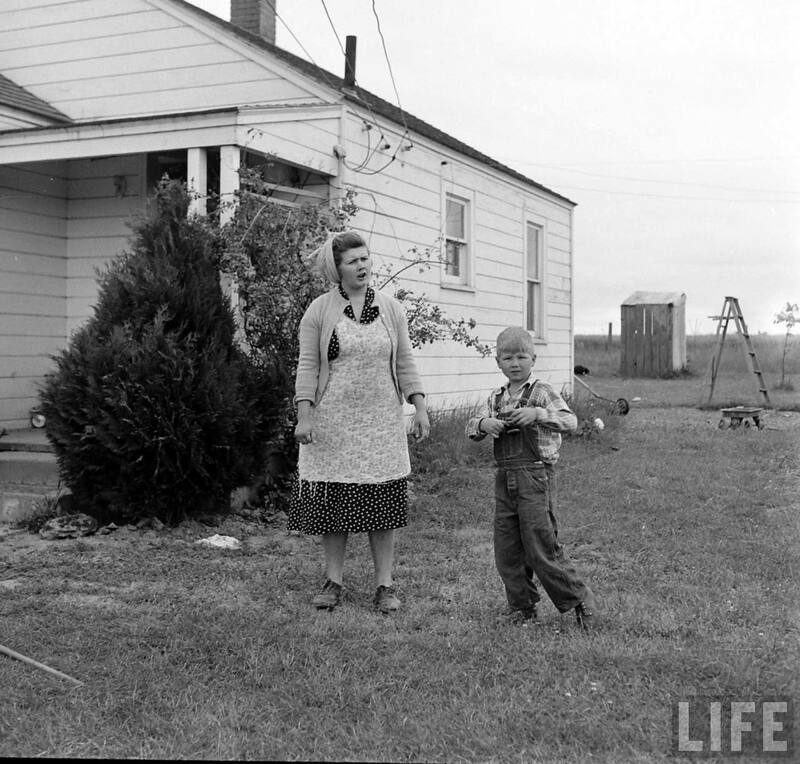 The photograph below, also from the Life photo essay, shows Mrs. Trent and the young boy standing at the front of the house. The ladder in the backyard (underneath the overhead wires) seen in the other photos can also be seen on the right in this picture. 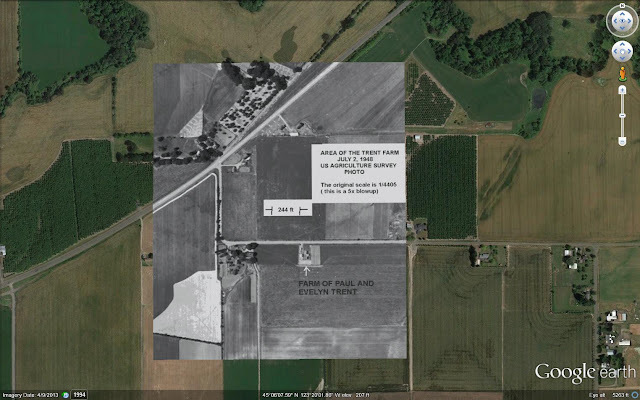 The layout of the Trent farm and the locations and significance of the Life photos can be better ascertained by reference to a 1948 aerial image of the property and its surroundings. It is shown below georeferenced onto Google Earth. Using Google Earth, the georeferenced image can be easily enlarged and distances measured with the Ruler tool. 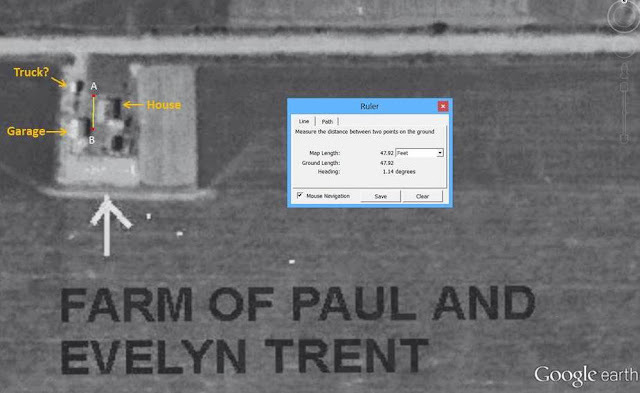 As the following annotated closeup reveals, the distance from the approximate backyard location of the ladder (B) to that of the subjects in front of the house (A) in the Life photograph is barely 50 ft. The north-south length of the house itself is approximately 32 ft. So if (per their accounts) Mr. Trent ran to the car from the backyard to get the camera and Mrs. Trent, remembering that it was in the house, went there to get it, one would expect them to intuitively cross the short distance to the open front of the property--toward the object--in order to photograph it and further observe it. That they evidently chose to return to the backyard to do so, if they are to be believed, does not make sense. These same thoughts--which argue in favor of the UFO being nothing more than a small object suspended from the backyard overhead wires*--may have crossed the Life photographer's mind as he snapped his telltale photographs on the scene. He may well have shared the opinion of a certain Judge Judith Sheindlin that: "If it doesn't make sense, it probably isn't true." I know I do. More than 60 years since the Trent photographs were taken, we live in an era of ubiquitous digital camera equipment where even celestial events, such as the meteor that streaked across Russian skies in 2013, are independently recorded by scores of devices. The lack of such simultaneous multiple recordings of unidentified structured objects in the sky provides a damning verdict on their lack of physical reality. * A 2013 analysis of the radiometric/geometric features of the Trent photos using a new software tool concluded that "the hypothesis of a small object hanging below a power wire is the most convincing." 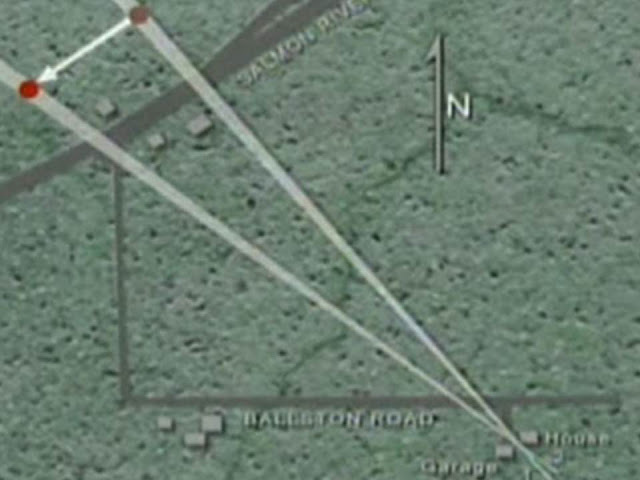 In addition, comparison of the lower overhead wire in the Life vs. Trent photos revealed that it "sags" lower in the UFO photos over an area centered above the UFO, plausibly due to the weight of a suspended object. A subsequent analysis to detect evidence of a suspension thread concluded that: "The clear result of this study was that the McMinnville UFO was a model hanging from a thread."